The Muralist by Barbara Shapiro highlights great artists around the 1940s including Mark Rothko, Lee Krasner and Jackson Pollock. Clhapter 12 opens with the main character, Danielle, visiting the Long Island home and art studio of Pollock-Krasner. Those are my feet on Jackson Pollock’s barn floor, which is speckled from the accumulation of his years of creating drip paintings. 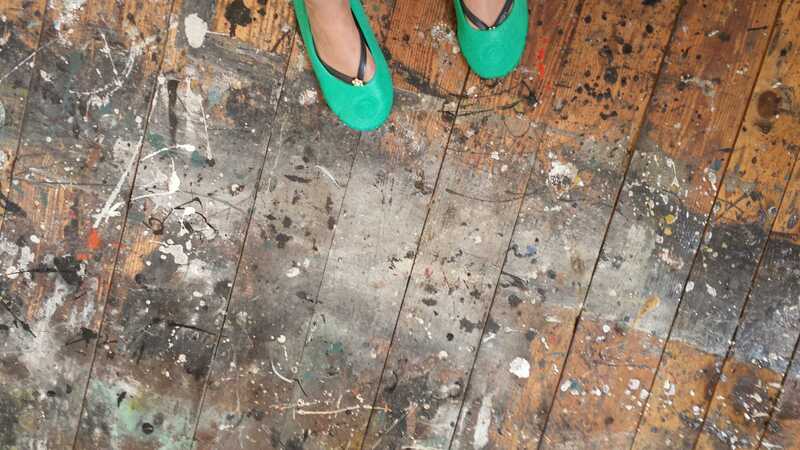 The author notes that the remnants on the floor from his work is artistic in its own right. That freedom of expression should be taken into account when doing makeup. There are no exact rules, just ways of applying cosmetics. A great example of free expression of makeup is Linda Mason . The author, Barbara Shapiro will be in DC on Monday, December 7 at Busboys and Poets. Check the link below.